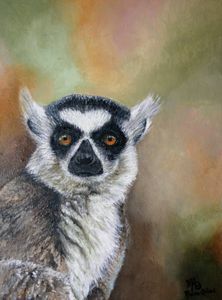 Lemur acrylic painting on canvas 30 x 40 cm. This painting can be shipped worldwide. Curious fact is that at the head of the Lemur group is a dominant Alfa female and in each family the women are the leaders. My name is Maria Arias, I was born in Venezuela and I have been an animal lover and defender all my live... I started painting at the age of 8 years old. Because of the hard schedule at the school, at the age of 12 I stopped it. I followed engineering studies, emigrate to France, running away from the chaos and Dictatorship regimen in my country and leaving everything behind. I arrived with nothing, not even the knowledge of the French language and finish doing a master and a PhD in chemistry …In 2007, I moved to the Netherlands when I could finally feel home again. Since last year, I started growing more spiritually. I did some healing and animal communication courses and therefore the importance of the eye of the animals in my paintings. I use shamanic music when making most of my paintings, it helps me to relax and to connect with the animal, I let myself go in a sort of trance full of love.. there is magic in all my paintings you can feel it. 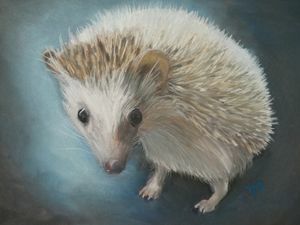 I donate from 20 to 10% of the value of my paintings to an animal cause. I want to bring a message with my paintings, I want people to understand that animals are big masters, they have an important mission as my paintings...all my paintings have one thing in common, they make you feel happy by transferring love and respect for and from the animals.